If you deleted or lost important photos on Android phone due to false operation, don't worry. Here in this page, you'll find how to recover deleted photos from android phone with a powerful Android data recovery software - i.e. Bitwar Android data recovery. At times, delete photos from Android phone is quite common way to release the storage capacity; however, sometime we may delete those photos we actually need mistakenly. Don't panic, there are plenty of ways to recover deleted photos from Android phone. Well, the key point is how we can find the right one to completely recover deleted photos on Android phone without loss or any harm to the device. There are many reasons can cause of photo loss on Android phone. But no matter what reason may result in data loss, you should keep in mind that as soon as you find out that you have lost some vital data, stop using your phone until you get your photos back. Otherwise, you are likely to lose your precious photos forever. Here, I'd like to recommend you one of the most professional data recovery software for android - Bitwar Android data recovery. It is an efficient and safe tool to recover deleted photos/pictures from Android phones and also with the abilities to recover loss of data due to OS update, factory restore, rooting or ROM flashing, locked phone, or backup sync failure, etc. You can always trust on this software to recover deleted photos from Android effectively and efficiently. 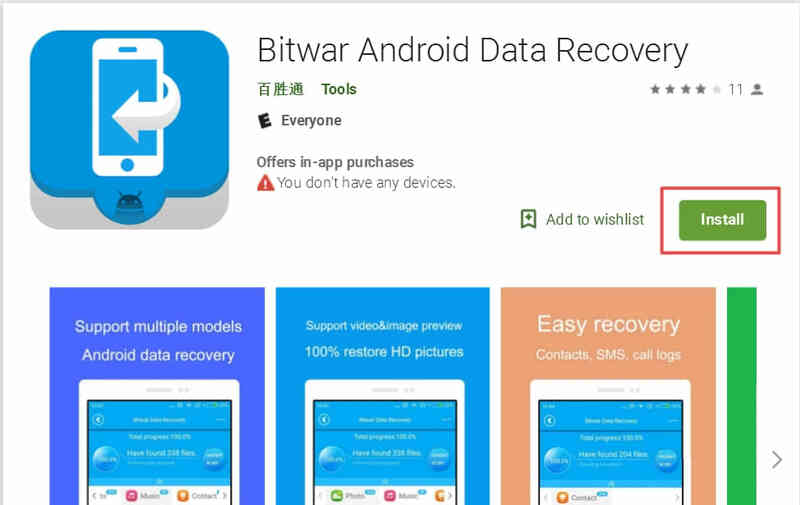 We have Bitwar Android Data Recovery for Windows and Bitwar Android Data Recovery (APP) which can help you get back these accidentally deleted photos. Step One: Before recovery, we have to turn on USB debugging mode and root our Android Phone first to get the administrator authority. If you have already rooted the phone, pass this Step. 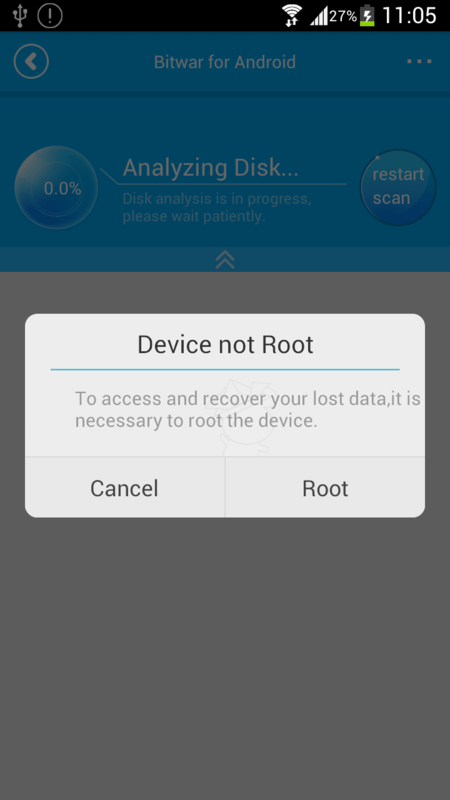 If not, you can simply read this article to get more: How to Root your phone. Step Two: If you have rooted your Android phone successfully. Launch Bitwar Android Data Recovery and connect your phone to computer with your original USB cable. Step Three: Select Photos on the interface and hit Deep Scan. Step Four: You can see the photos are appearing in the scanning result windows. You can preview the photo to check the photo is completely for recovery or not. Then select it and hit the recover button. After this, you can save a copy of those recovered photos as a backup on computer and then you can transfer them into your Android phone to continue using them again. Step 1: Launch Bitwar Android Data Recovery Application, if your phone do not contains root, it will inform you to root the phone first. We can click root to download the root application. For information on install APK Root on your Android device and how to root, please refer to How to Root your phone. Step 2: After rooted, there's an Analyze Device window pops up before you go next with photo, video, audios recovery, etc. Step 3: Select Photo, the app starts to search your accidentally deleted photos on your phone, you can see the photos are appearing in the window. Step 4: Select the photos what you need and click Recover to have them saved to your android phone. Now you know how to recover deleted photos on Android APP. After following this guide, you would be able to recover deleted photos from Android phone. And in this way, you can also recover lost videos, apps, contacts, messages, music or call logs from your Android phone without losing any details. So if you have lost photos or other files from your Android phone, you can't miss it. Previous：How to Recover Deleted Text Messages on Android?